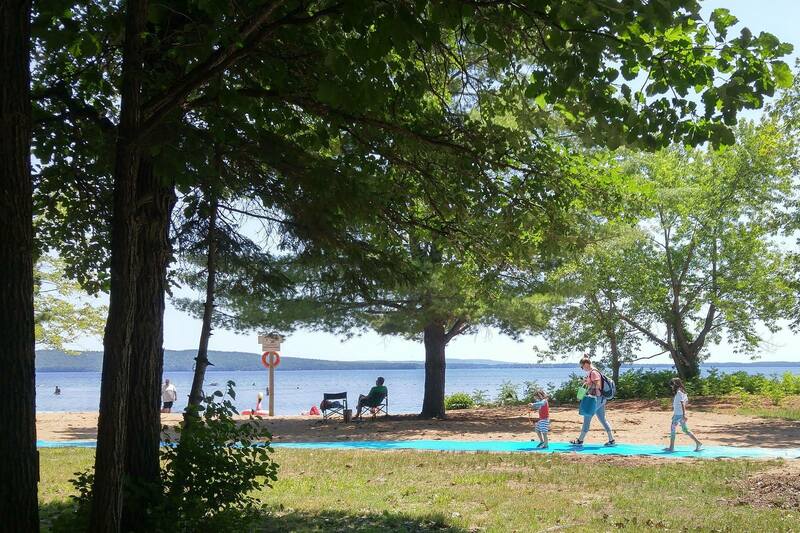 Family Fun at Ontario’s Bonnechere Provincial Park! Some of the best memories of my life have involved camping. Sadly, I can’t say the same for my children. Every summer growing up, my parents packed up our Bonair pop up camper trailer, hitched it to the back of our Oldsmobile and our subsequent Pontiac station wagon, threw us kids into the back seat and off we went for weeks on end, starting from our home in Belleville, Ontario mostly to the east coast going through Quebec, New Brunswick, Nova Scotia and Newfoundland. Some of the best memories of my childhood involved those camping trips. I am not new to camping or even glamping. Back in March, I was lucky enough to spend a few days in a Yurt at Mew Lake in Algonquin Provincial Park. It was my first glamping trip. My kids however…they are a different story and my personal failing as a parent. Miss M can count on one hand the times she has been camping in her life—two of them include Girl Guide camp and for Little Man, this was his first time. Yes, we are an urban family, but there’s no excuse for an outdoor lover like me to have been so neglectful in my duty to expose them to everything. When Ontario Parks offered us one of their four rustic cabins to try out glamping at Bonnechere Provincial Park, I knew that would be the perfect opportunity to introduce my kids (ease them in) to the camping experience. 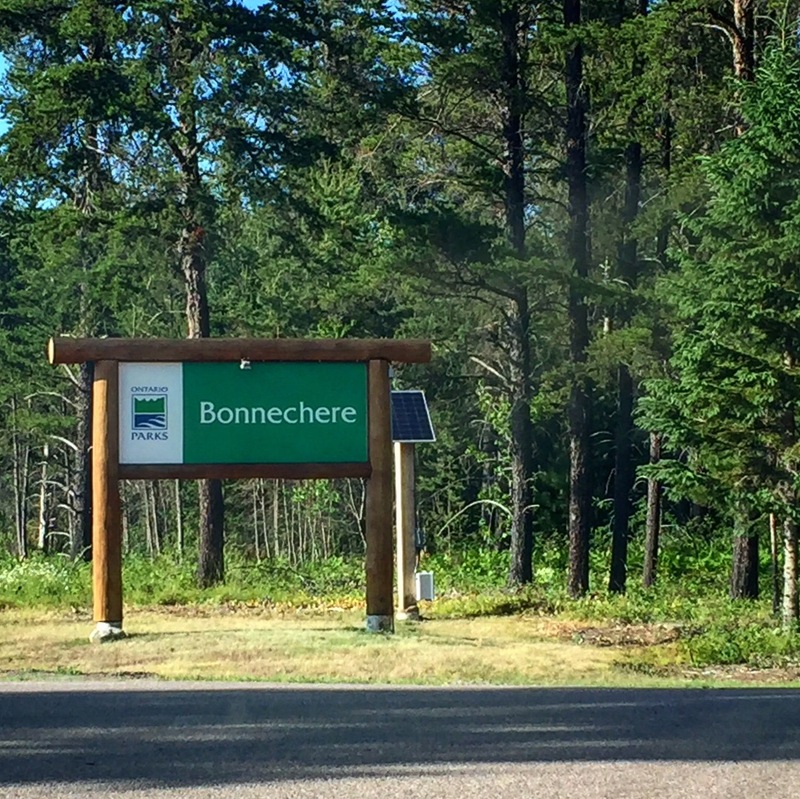 Bonnechere Provincial Park is in Renfrew County is approximately 20 minutes north of Killaloe, Ontario and 45 minutes west of Pembroke, Ontario. It’s also just south of the far east tip of the more well known Algonquin Provincial Park. 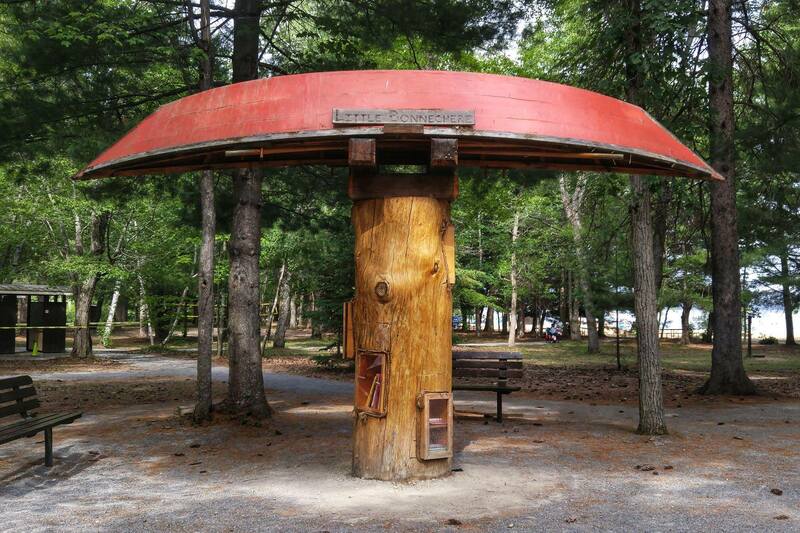 The park was established in 1967, is a smaller sized campground in the Ottawa Valley with a limited number of campsites and four rustic cabins. There is car camping in three sections of the campground—Tall Pines, River Loop and Sandy Flats (radio free and no electricity in this section). All campers have access to a large central comfort station (showers), laundry facilities and water taps. Mini comfort station are also available with showers. Facilities with toilets and sinks to wash hands and water taps also exist throughout the campground. The beautiful and scenic Bonnechere River meanders through the park and one of the best features of the campground is the gorgeous, accessible beach on Round Lake. The park has floating wheelchairs that you can borrow from the camp store, there is a blue mat that makes a pathway from the day use area across the beach to the water to make the beach barrier-free for people with wheelchairs, walkers and parents with strollers. Big win for anyone who has ever had problems getting through the sand in the past. There is a hiking trail called FIT (footprints in time). FIT is based on the traditional local First Nations way of teaching and explaining history. The trail takes you in stride with 13 giant footprints, marked by posts with interpretive and educational text designed to be informative and engage you and your family along the hike. It’s a 2 KM loop trail and super easy for all hikers – kids included. Another neat park feature is the “book tree” outside the park store near the beach. It’s like a little outdoor open library and the windows and shelves are at the height of the intended reading level—my kids loved it and enjoyed taking the books out (they were returned as well). The rustic cabins have two bedrooms, one has a bunk bed and they are full-size mattresses, the other bedroom is a double bed. You will need to bring your own bedding. The bedrooms also have a functional wardrobe, score! You might be camping, but can actually hang up your clothes. There is a small living area with sofa and a propane fireplace. The kitchen has an electric bar fridge and microwave, seating is a custom pine dining table and there is an outdoor BBQ for cooking. There is no sink or running water (this is the rustic part!) The cabin we stayed was a short walk to a toilet and water tap. As far as introducing the kids to the real camping experience, this was a good start. My daughter kind of has high standards for her tender age (read this as she has a lot of experience with high-end resorts) and I knew that a tent would not be the best way to encourage a love of the great outdoors. My son is super content wherever he is, whatever he is doing, so I have a feeling he is the outdoors child in the family and he and I will have a lifetime of experiences together doing things like this. To reserve a cabin at Bonnechere, please call 1-888-ONT-PARK (1-888-668-7275) or book online. A version of this post originally appeared on KathrynAnywhere. It has been reprinted with permission.